Patios and balconies are luxury features that let you enjoy the advantages of being outdoors without any of the upkeep. People are often content to just put a couple of lawn chairs out and call it good, but it takes only a bit of imagination and planning to turn your patio or balcony into your personal retreat. We'll get you started with these suggestions for decorating the patio or balcony at your Springs Apartments home. Select the ones that mesh with your style, or use them to get your creative juices flowing! The impact of a beautiful floor is sometimes overlooked, but placing a ground cover on your balcony or patio makes it feel like an extension of the interior. Interlocking deck tiles are attractive, durable and easy to clean. If you love color and patterns, get an inexpensive tablecloth and coat both sides with polyurethane for a customized area rug. Wouldn't it be nice to have a relaxing area where you can enjoy your morning coffee or settle in with a good book and a cold beverage? A round table with two café chairs is a charming way to play on the open-air ambiance. Don't feel obligated to purchase new furniture. Pieces like Adirondack chairs picked up at a resale shop can be personalized with just a little TLC. A narrow bench with hidden storage is a great multitasking piece. It serves as additional seating or a plant stand and you can keep a throw, a couple of pillows or other items inside. Experiment with different arrangements. For instance, you can place your seating against the railing if you want a roomier feel. For truly unique furnishings, go with DIY pieces like this rustic cocktail table made from discarded pallets. Plants are the perfect accessories to bring another touch of nature to your balcony or patio. 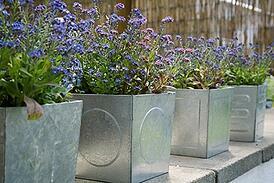 A big plus is the infinite variety of containers available to accommodate a multitude of styles. Think vertical to save valuable floor space. This inventive pallet garden rests against a wall, holding lots of plants while taking up minimal horizontal space. Add depth and visual interest by staggering the heights of your plants. For a simple but functional plant stand, use tiers of wooden planks separated by cinder blocks. A balcony railing makes a great home for plants with containers like these unusual styles. Enhance your dinner table with fruits, vegetables and herbs grown right outside on your balcony or patio. As a Springs Apartments resident, keep your ears open for our occasional patio decorating contest. You may have a chance for bragging right, and maybe some great prizes! How have you put your individual design stamp on your balcony or patio? Share your ideas in the comments!